Pure Maple Syrup is made only in the springtime when the trees are thawing out from a long winters nap. 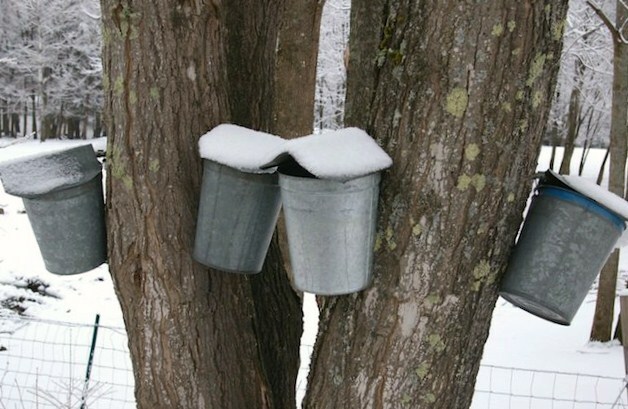 Many books have been written explaining how to properly make Maple Syrup and experts from all over the maple belt like to offer advice on proper production techniques. However, making great tasting Maple Syrup is not something you learn about from a book. It is not something you learn from a class. Great syrup making is an art that takes years to perfect. It is a skill that is passed down from generation to generation through the most subtle ways. At Hilltop Boilers, we have mastered the art of syrup making. Great tasting Maple syrup starts right at the tree. In Newﬁeld and Limerick we tap Sugar Maple trees that are in open areas. While others are trying to see how many taps they can have, we are trying to selectively pick only the healthiest trees. These trees arenʼt competing with other trees for sunlight and moisture. The maple sap is sweeter and there is more of it. Nearly all of our maple sap is then collected from buckets and is collected on a daily basis. Sap spoils much like milk and leaving it in tanks or tubing systems for extra hours causes a lower quality of syrup. Once the watery looking maple sap is in the sugarhouse we process it on a wood ﬁred evaporator. No Reverse Osmosis machines or oil ﬁred evaporators can be found in our sugarhouse. While there is nothing wrong with these labor saving machines, we prefer to simply use a wood ﬁre. Wood is a renewable resource and certainly much better for the environment than petroleum products. Once the Maple Syrup is made it goes through the ﬁnal ﬁltering stages. This ﬁltering system is very complex and all but guarantees that natural sediment from the tree has been removed. Finally the syrup is hot packed, sealing in the great ﬂavor you have come to expect. The evidence is in the taste. Not all Maple Syrup is created equal. Different regions and different processing techniques surely make a big different in the ﬂavor of Pure Maple Syrup. People who donʼt care for Maple Syrup have often said they have fallen in love with ours. Its all natural, all pure, and contains no additives or preservatives. Straight from the tree. You too will fall in love. Maine has a Pure Maple Syrup grading system that uses four different grades. These are Golden Color with Delicate Flavor, Amber Color with Rich Flavor, Dark Color with Robust Flavor, and Very Dark Color with Strong Flavor. Each of these grades have a speciﬁc range for color and ﬂavor. There are no density/ thickness variations among the grades, all are the same. Individual preference for a particular grade is common, however we ﬁnd that most of our customers prefer our 2014 award winning Grade A – Amber Color with Rich Flavor Maple Syrup. In fact, all of our glass bottles are only packaged in the Amber Color with Rich Flavor as it is most desireable. Grade A: Amber Color with Rich Flavor Pure Maple Syrup has a slightly stronger ﬂavor with a noticeable darker color. This syrup is by far the most popular choice for all purpose syrup. This grade has a rich full bodied taste that makes it the perfect compliment to most foods. It is the gift of choice by many. This grade used to be referred to as medium amber. In early 2015, Hilltop Boilers won a third place award by the Maine Maple Producers Association award for the best amber color syrup in Maine. You will absolutely love this grade. We package all of our glass bottles in this grade as it is most beautiful in glass and the flavor is just perfect. Grade A: Dark Color with Robust Flavor Pure Maple Syrup is much darker in color and has a stronger more robust maple ﬂavor. It is less desirable as a table syrup but often preferred in baking and cooking because of its strong ﬂavor. This syrup is great to pour over baked apples or squash or use as a glaze on meats and vegetables. Similar to a traditional dark amber colored syrup. Grade A: Very Dark Color with Strong Flavor Pure Maple Syrup is generally very late season syrup. It is great is foods and recipes where a strong maple presence is desire. Wonderful in cookies, breads, and baked beans. Similar in grade to what used to be called Extra Dark Amber or Grade B. Due to the nature of this syrup, we only package this grade in larger plastic containers. We are often asked, “What causes the different grades of maple syrup?” The answer is simple. The amount of bacteria that grew in the syrup during the collection and processing phases. This growth causes the color to darken, the ﬂavor to become more robust, and the sugars to be more fructose and glucose and less of the quality sucrose. Over many decades, we have developed and reﬁned techniques for collecting and processing maple syrup so that many seasons we never produce anything but Grade A maple syrup. 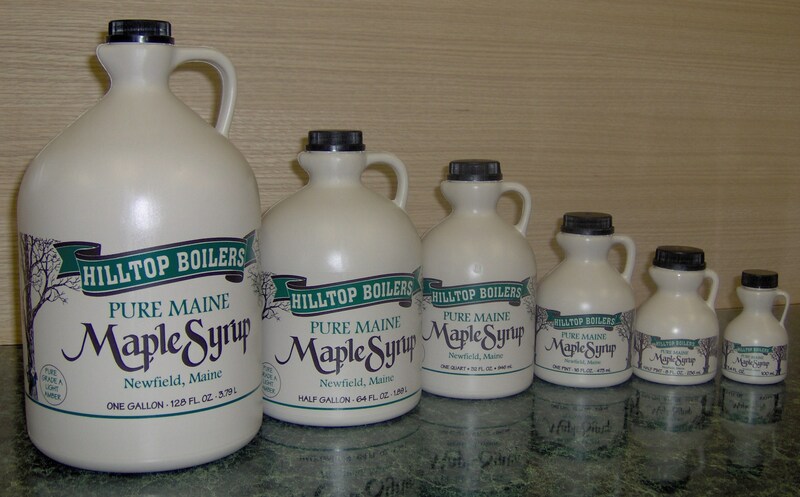 Maine has a tough mandatory maple syrup law. Pure Maine Maple Syrup must adhere to some of the strictest standards for density, clarity, color, and ﬂavor. Maple inspectors enforce these laws and assist producers in maintaining high standards and superior quality in their maple products. Looking for Grade B……You will notice that we have not discussed Grade B Maple Syrup anywhere on this website. As of 2014, No maple producing state or province of Canada recognize the term Grade B and therefore it is illegal to sell Grade B maple syrup following the phase in period of these new Grading Standards. If you are looking for Grade B, the most similar product, now available, is Grade A: Very Dark Color with Strong Flavor. At Hilltop Boilers, we have a much stricter grading system in place than the minimums set fourth by the USDA and the Maine Grading Law. We take great pride in the ﬂavor of our Pure Maine Maple Syrup. You will notice a difference in our ﬂavor right from the ﬁrst spoonful out of the bottle. Our unique production processes enable us to consistently produce an extremely high quality syrup each and every time will boil. Try it for yourselves. To use maple syrup in place of a cup of sugar in baking, use 3/4 cup, but decrease the total amount of liquid in the recipe by about 3 tablespoons for each cup of syrup you use. Unless the recipe calls for buttermilk, sour cream, or sour mile, it may be necessary to add 1/2 tsp baking soda to the dry ingredients for a better rise. Often it is best to cook at about 25 degrees less temperature too. To use maple syrup in place of sugar in cooking, use 3/4 cup for every 1 cup of sugar. Pure Maple Syrup is made from maple sap from the xylem of the maple tree In the boiling, concentrating and ﬁltering process the nutrients remain in the syrup. There are measurable differences in syrup’s nutritional composition, due to metabolic and environmental differences among maple trees and differences in the methods of collection and production. A 3.5 ounces serving of Pure Maple Syrup contains 261 kcals the equivalent of 1,093 kJoules. There are 67 grams of carbohydrates. Very little fat and no protein is present. Maple Syrup consists primarily of sucrose and water with small amounts of other sugars such as fructose and glucose, especially in the darker, lower quality grades. Sucrose is an important source of energy. The main sugar in pure maple syrup, sucrose, is the sole sugar in Grade A light amber Maple Syrup. The darker grades of syrup contain a small and variable amount of fructose and glucose. Maple Syrup contains some organic acids, most predominantly malic acid. The main minerals present in pure maple syrup are calcium, potassium, manganese, magnesium, phosphorus, and iron. There are also measurable amounts of zinc. Both zinc and manganese are antioxidants that have been attributed to improved health and strengthened immune systems. Trace amounts of vitamins are present in Pure Maple Syrup. These include vitamin D, riboﬂavin, Vitamin B5, Vitamin B6, niacin, biotin, and folic acid. Pure Maple Syrup has 15 times more calcium than honey with 1/10th the sodium. Amino acids, the building blocks of protein, are present in very small levels in Pure Maple Syrvolatile organic compounds such as vanillin are also detectable in syrup.